Ready to transform your LinkedIn presence and bring in more profit? You have seconds to make a great first impression. What impression is your LinkedIn profile making right now? Is it helping you to be known, remembered and chosen by more people in your target market? Whether you are looking for new clients, new contracts or opportunities, your audience are looking for you online. If you cannot be found and get lost in the crowd, how will they know how perfect you are for them? LinkedIn is the largest professional social network and a publishing platform among other things, and is the go to tool for many professionals. A well-written profile will show up on Google and could even out-rank your website. Do you struggle to write about yourself? Talking about your career achievements, qualifications and expertise can be a challenge, as we try to balance our personal brand, career brand and our ego. We either go straight into tooting our own horn, which may appear arrogant, or we skirt around it and miss the mark completely. There is a fine art to positioning yourself as the expert you are, while focussing on your ideal client. Throw the 'Tall Poppy Syndrome' out of the window and build a strong personal professional brand that connects with your audience, through our proven formulas, framework and expert support. Using tools such as LinkedIn can be daunting and often people don't do anything for fear of looking unprofessional. Get your LinkedIn presence under control through expert support, tutorials and templates, through our 12 part program. If you can commit to once a week, you will build a profile that you can not only feel proud of, but connects and converts in just 3 months. Interested? I have trained thousands of people in how to set up and use LinkedIn through mentoring, and workshops. This online course brings the training to anyone, anywhere at an affordable price. ... build and boost your personal brand? ... be the go-to-expert in your field? ... take up the first page go Google results? ... attract more leads and opportunities? ... be known remembered and chosen? If you answered yes to more than one of these questions, have some time and are ready to invest in yourself, then lets get started! If you want all this but have no time, then chat to me about my other profile building, mentoring and management services. The program is split into bite sized chunks with actionable tasks, with the view that at the end of the program you will not only have an up to date professional profile, but will have a plan to remain visible, memorable and top of mind. Even a professional with an All Star Profile will learn new things. 12 comprehensive Lessons, with video, slides, worksheets and templates to work with your preferred learning style. The program is suitable for business owners, consultants, marketing staff and business development managers, and staff. Any professional can benefit from this program. Speakers, trainers, business coaches, real estate professionals, property experts, legal and financial services, virtual assistants, graphic designers, copywriters, marketing managers, photographers, authors and many more. I look forward to helping you transform your profile into a personal landing page to showcase your talents and expertise, and build an online profile that increases your profits and brings you opportunities. 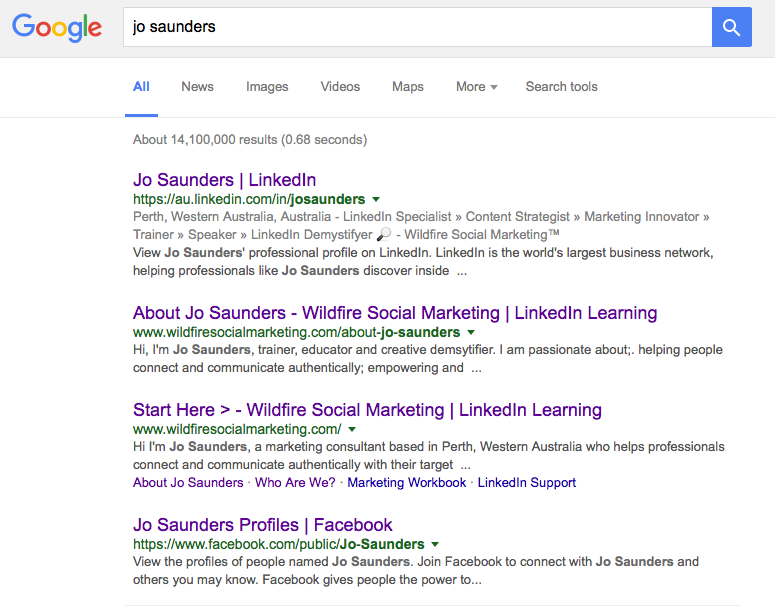 Jo Saunders is an international LinkedIn expert, marketing strategist and social media educator who has been helping people connect since the 90s. She is the co-author of 'Get Good or Get Off - A guide to getting it right on social media', a host of #LinkedInLocalPerth and video series #TheLinkedInCouch and was named #2 LinkedIn Expert in Asia Pacific for 2018. What are your biggest LinkedIn frustrations right now? Social Selling Index (SSI) - What is yours? ​What is your current SSI? How Often Will You Back Up? What is your SSI now?